Warm transfer eliminates this problem - it allows your agents to have the ability to dial in another agent in real time. Today we'll add warm transfer to a Python and Flask application so we can engender warm feelings among customers talking to support. The first agent becomes available by connecting through the web client. The second agent becomes available by connecting through the web client. A customer calls our support line. While the first agent is on the phone with the client, he or she dials the second agent into the call. Once the second agent is on the call, the first one can disconnect. The client and the second agent stay on the call. First, let's configure the voice web-hook for the Twilio number that customers will dial when they want to talk to a support agent. In production, this should be the public-facing URL for your app. Awesome, now you've got a webhook in place. Next up, we'll look at some of the code. Here you can see all front-end code necessary to connect an agent using Twilio's Voice Web Client. For this tutorial we used fixed identifier strings like agent1 and agent2 but you can use any unique application generated string for your call center clients. 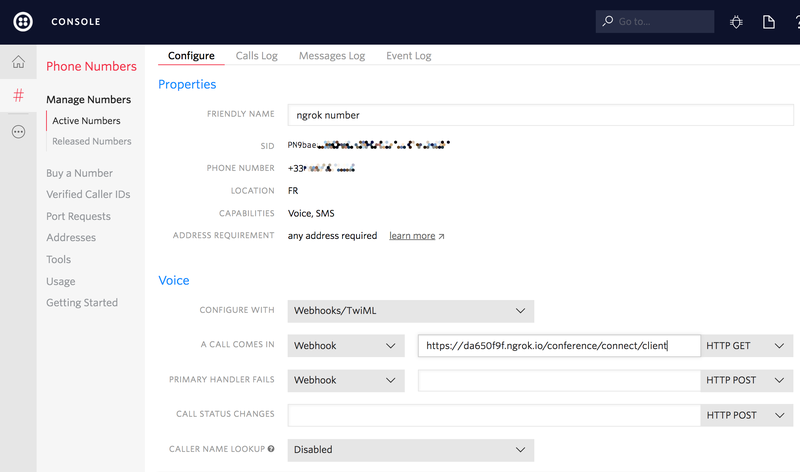 These identifiers will be used to create outbound calls to the specified agent using the Twilio REST API. When a client makes a call to our Twilio number the application receives a POST request asking for instructions. We'll use TwiML to instruct the client to join a conference room and use the Twilio REST API client to invite (and initiate a call to) the first agent. When providing instructions to the client, we also provide a waitUrl. This URL is another end point of our application and will return more TwiML to SAY welcome to the user and also PLAY some music while on hold. Take a look at the code here. We use the client's CallSid as the conference identifier. Since all participants need this identifier to join the conference, we'll need to store it in a database so that we can grab it when we dial the second agent into the conference. Next up, we will look at how to dial our first agent into the call. With that in mind, let's see how to add the second agent to the call. When the client and the first agent are both in the call we are ready to perform the warm transfer to a second agent. The first agent makes a request passing its identifier to allow us to look for the conference_id needed to invite the second agent. Since we already have a call module, we can simply use the call_agent function to connect the second agent. When the three participants have joined the same call, the first agent has served his or her purpose. Now agent #1 can drop the call, leaving agent #2 and the client to discuss support matters. Both agent one and two have startConferenceOnEnter set to true. For the client calling and for agent two, endConferenceOnExit is set to true. Translated, this means a conference will start when either agent joins the call. It also means the client or agent #2 disconnecting will hang up the call. Now let's look at some other great features Twilio makes it easy to add. Thanks for checking this tutorial out! Let us know on Twitter what you've built... or what you're building.